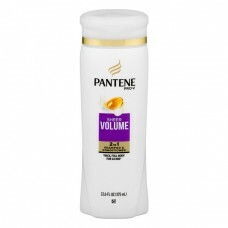 Pantene® Pro-V® Sheer Volume 2 IN 1 Shampoo & Conditioner. Thick, full body for 24 hrs*. 12.6 fl oz (375 ml). Experience Pantene's Extraordinary Formula with Unique Pro-V Nutrient Blends. Nutrient-rich lather. Effortless detangling. Lasting shine. The Sheer Volume formula helps give you noticeable volume, lift and control. * Made of U.S. and/or imported ingredients. *Use with Volume Body Boosting Mousse. Questions? 1-800-945-7768 or visit www.pantene.com.